We’d love your help. Let us know what’s wrong with this preview of Do I Look Fat in This? by Rhonda Britten. The author of Change Your Life in 30 Days and Fearless Living confronts that nagging question from the inside out. As a Life Coach on the Emmy Award-winning daytime reality show Starting Over, Rhonda Britten has helped countless women befriend their bodies-first by encouraging them to face and accept what they see in the mirror, and then by empowering them to make healthi The author of Change Your Life in 30 Days and Fearless Living confronts that nagging question from the inside out. 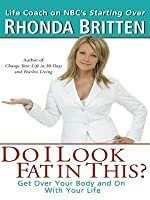 As a Life Coach on the Emmy Award-winning daytime reality show Starting Over, Rhonda Britten has helped countless women befriend their bodies-first by encouraging them to face and accept what they see in the mirror, and then by empowering them to make healthier decisions about their weight. To ask other readers questions about Do I Look Fat in This?, please sign up. Be the first to ask a question about Do I Look Fat in This? I do not watch TV, so I was not familiar with her work on "The Starting Over House" until I read this book. I had caught the show once or twice while traveling, so I quickly made the connection between the life coach I'd seen, and the author. Rhonda writes in a personal, easy-to-read style that makes her readers feel like she's sitting down with them over a skinny latte at the local Starbucks. She puts up no pretensions, and readily shares her less-than-glamorous personal history and struggles. I do not watch TV, so I was not familiar with her work on "The Starting Over House" until I read this book. I had caught the show once or twice while traveling, so I quickly made the connection between the life coach I'd seen, and the author. Rhonda writes in a personal, easy-to-read style that makes her readers feel like she's sitting down with them over a skinny latte at the local Starbucks. She puts up no pretensions, and readily shares her less-than-glamorous personal history and struggles. The strengths of this book are Rhonda's approachability and sound advice. Where it falls a bit short is I feel it tries to do too much at once. Rhonda's personal struggles are interspersed with those of the participants in The Starting Over House and the women who shared their feelings about their bodies for the photos at the beginning of each chapter. I think the book would have been stronger if she had stuck to one approach -- just her own stories, or just those of the clients she's helped. Instead, I felt a little like a pingpong ball, zipping between one story here and Rhonda's story there. All that said, Rhonda's message is simple and clear: You can live in the NOW, or you can put off your "real life" until you lose five, ten, fifteen, or more pounds. The life in that future time is less important than your life in the here and now, so you may as well get moving. I read this book with a group of women, and we discussed each chapter a week at a time. I highly recommend approaching the book this way, as there are a number of practical suggestions in the book that are worth trying for a week, and then discussing to see what worked and what didn't. I don't think this is a book you can sit down and read in one fell swoop and expect to get results. It's one that takes time and commitment, which I understand isn't for everyone. But I've reaped a lot of rewards I read this book with a group of women, and we discussed each chapter a week at a time. I highly recommend approaching the book this way, as there are a number of practical suggestions in the book that are worth trying for a week, and then discussing to see what worked and what didn't. Rhonda Britten was a life coach on the reality TV series Starting Over during the time this book was written and published. 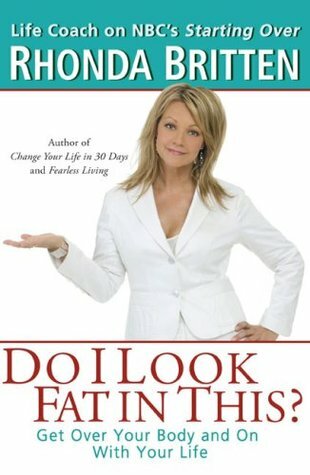 She has written several other books beginning with Fearless Living in 2001. In Do I Look Fat in This?, Britten covers the issue of body image and weight. The book is part memoir, part self-help. I liked that this is a book about processes, not results. The writing isn't the best, but the ideas are strong. It's not "here are the right things to do to get your body beautiful" it's "here are the right things to do to treat your body the right way. don't abuse your body because it has x and not y, and find a b and c ways to love it." I loved this book. The author is very relatable and it feels like you're talking to your best friend when you read it. Some of the advice is not new, however, a lot of points get through to you and also the written exercises are effective. I met the author and her books reflect her relatable, honest and heart-warming personality! I can't wait to read her other books. Everyone has body image issues and this book is a great start at understanding yours and taking the first steps to healing the negative attitudes towards our bodies that hold us back and hinder our happiness. It referenced her now cancelled talk show too much to be effective for me, but others might benefit from the message. Self help book that was almost inspired. Written by “Starting Over” lady which was interesting to find out. Did it help me get over my body issues? No. Nothing really new in this book.